a day with the judds.. When you go upstairs in the Judd home, there is a huge photo of their newborn twins and older brother Carew. Stacy told me that she and Matt would often look at the photo I took of the boys and every time they passed it, it seemed like there was a hole between the brothers. Like a missing piece. Baby Crosby, it seems, was the last unexpected yet perfect piece to this family puzzle. Life in the Judd home is a constant buzz of activity, as would be expected in a home of four adorable boys. The twins were knee deep in potty training during the day I spent with them, Stacy nursing baby Crosby, Matt refereeing the older boys in their play. I arrived at 6:30 AM just in time to see lots of sleepy cuddles as the boys woke to read books and eat cereal…spoons optional. 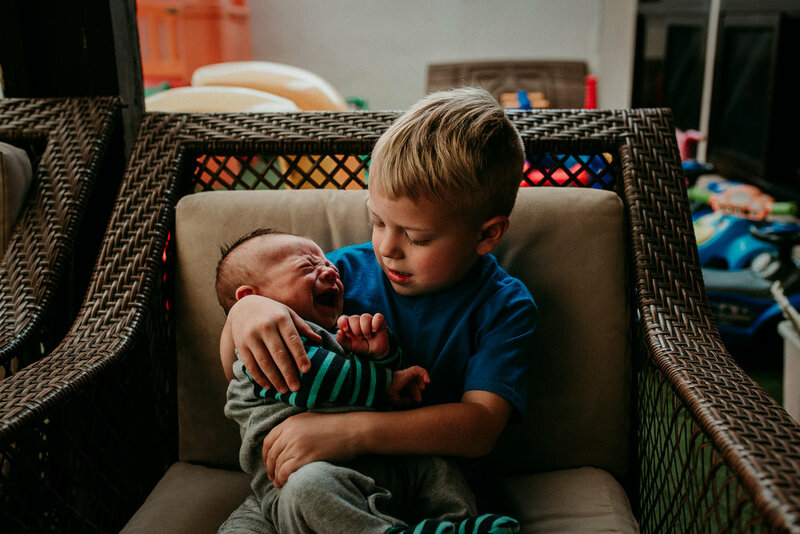 Crosby had woken early that day so he got to get a little extra love from big brother Carew. Twins Brooks & Walker were bare bummed, making panicked trips to the little green frog potty. In the midst of all the action, Stacy is calm and collected. “It takes a lot to stress me out,” she tells me as one twin is pooping, the other is running around naked, sweet baby Crosby is nursing, Carew is trying to play with Crosby while he is attached to Mom, and Matt is cleaning up the questionable puddle in the living room. And I’m in awe - more aware that it takes very little to stress me out. There is something so amazing about seeing friends rise to the challenge of incredible circumstances in life. I’m pretty sure this qualifies… Crosby was the unexpected surprise. And while that took a great deal of getting used to (9 months to be specific), he is fitting into the fabric of this beautiful family like he was that last missing piece. Now complete. I’m humbled that I get to see life (and new life at that) unfold first hand. It’s a front row seat to the small moments that make up an incredibly evolving family story. To date this has been my favorite story to both film and document (film is below). Real life is the bare bums, the newborn cries, the fights over baseball bats, the soft kisses to baby cheeks, and the love that is so very evident in this family. Scroll to the bottom to see the film... did I mention it's my favorite so far?! I hope you feel the love that I got to experience!